Winter is still here. It reared its ugly head and dumped 6 or 7 inches on us the other day, though most of it is gone now. 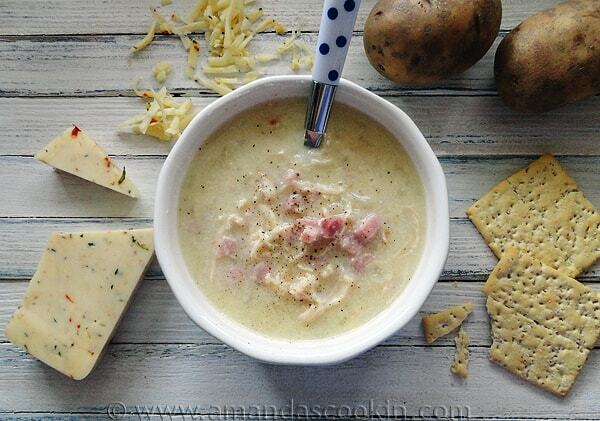 When the days are cold like this, I love to have a piping hot bowl of homemade soup for lunch, and I’m especially fond of chowders. 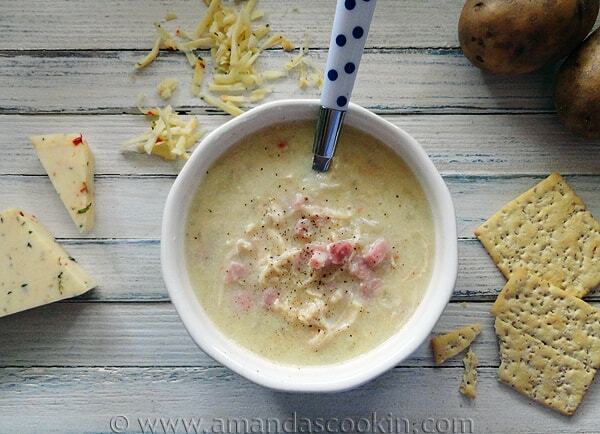 A batch of soup freezes well and makes for several hot lunches throughout the month. 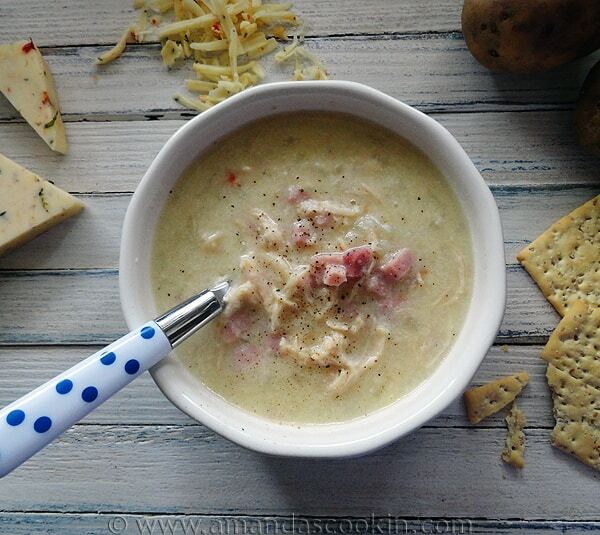 This satisfying soup is filled with shredded chicken, diced ham and delicious melty cheese. As you know I founded the Secret Recipe Club. Each Monday a bunch of bloggers post their recipes from their secretly assigned blog and reveal themselves to everyone. Sometimes on Reveal Day there’s what we call an orphan. That means that whoever was supposed to make something from this particular blog didn’t. Whether they simply forgot or had a real life emergency, it still leaves someone without a reveal to look forward to. When I started browsing Krista’s blog I was actually quite happy to find that her and I have very similar tastes. So many of her recipes were tempting me! In fact when I shopped for the soup ingredients this morning, I also bought what I needed to make her spinach dip! There were quite a few others too, but this soup really jumped out at me. 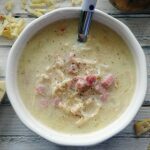 Krista’s version is called Chicken Cordon Bleu Soup and uses Swiss cheese, inspired by the dish of the same name. I’m actually not a big fan of Chicken Cordon Bleu itself, but the recipe looked really satisfying, so I made a few adjustment to suit my own tastes and love the way it turned out. 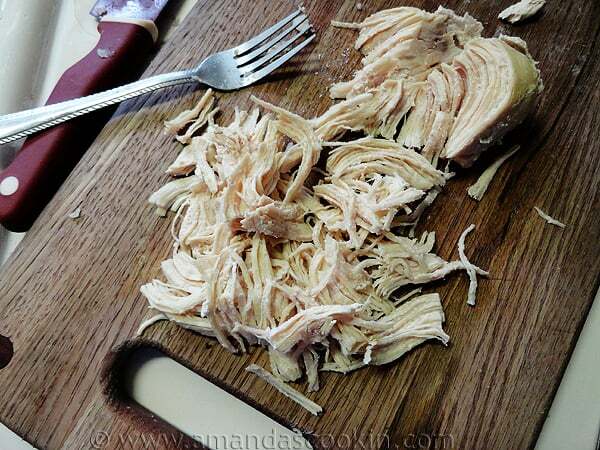 Because I was in a hurry, I threw some chicken breasts into my pressure cooker to give them a shredded consistency. Krista’s suggestion of using a store bought Rotisserie chicken is excellent, but I hit the grocery store pretty early so there weren’t any ready yet. 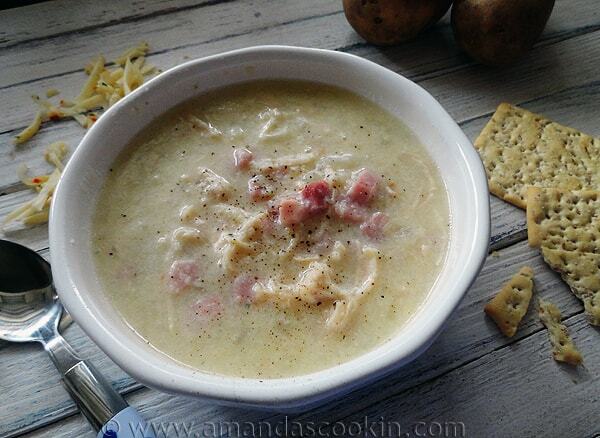 This would be a great soup to make after Easter when you have all that leftover ham! Since I didn’t have any leftovers, I used some ham steaks I actually had in the refrigerator. Wash potatoes and pierce the skin with a fork. Microwave for 5 minutes. Rotate them, and cook for another 5 minutes, or until done. Meanwhile, in a stock pot over medium heat, melt the butter. Add the garlic and onion, and let cook until tender and garlic is just beginning to brown, stirring frequently. Sprinkle the flour over the onion mixture in the pan and stir together with a wooden spoon. Let the mixture cook for 1 minute, stirring regularly. Slowly add the milk a little at a time while whisking constantly. Add the chicken broth, and whisk well. Bring mixture to a simmer, and heat until thickened, about 5 minutes. While your soup is thickening, cut the microwaved potatoes in half length-wise and scoop out the flesh. 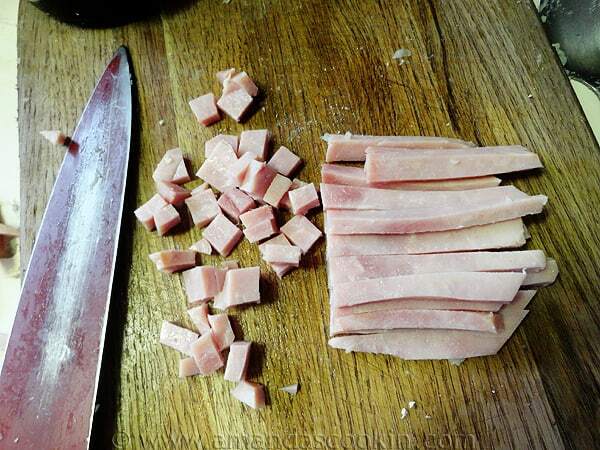 Cut or mash into small pieces. Measure out your chicken, ham and cheese. Turn the heat to medium-low, and add the potatoes. Sprinkle the soup with salt and pepper. Add the cheese, chicken, and ham. 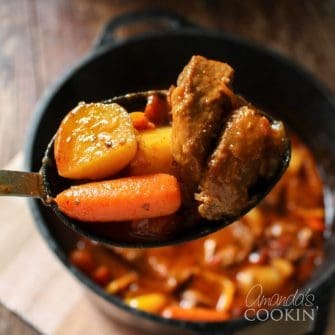 Warm through and serve hot! 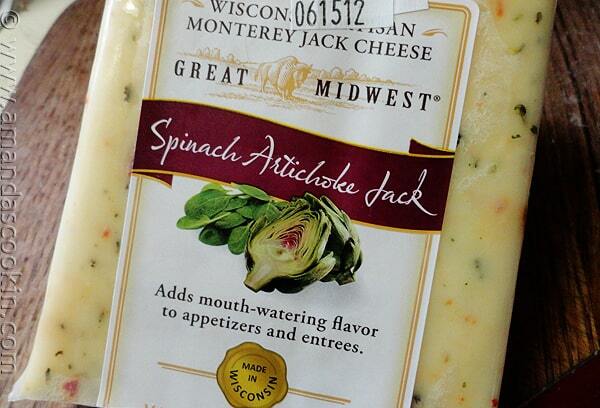 Makes 8 1-cup servings The nutritional information was calculated using Spinach Artichoke Jack which contains 100 calories per 1-ounce serving. 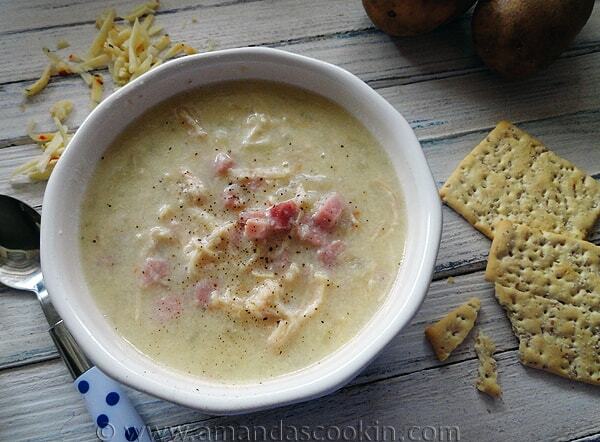 Be sure to check out Double Dipped Life for more delicious recipes.